Things just aren't going Aimée Leduc's way. After a meeting with Commissaire Morbier, she learns that she will have to testify in a court case against the Corsican mafia. Her partner René Friant has had a lucrative job offer from Silicon Valley, and he's on a plane to California. Her detective agency has more work than she knows what to do with, and she's hoping that her part-time computer hacker, Saj de Rosnay, will be able to help her out. But things really start going pear-shaped when she and Saj are involved in an accident in René's beloved car. Now there's a dead man lying in the middle of the street and Yuri Volodya, a grumpy old Russian who lives there, insists on hiring Aimée to protect a painting. The only thing that makes her agree to the job is the fact that Volodya says that he knows her mother. By the time Aimée gets to his apartment in Montparnasse, the painting has already been stolen... and the very next day the old Russian is found tortured to death in his kitchen. Some very dangerous people begin threatening Aimée and her co-workers, witnesses are dying, and all this Parisian private detective has to do is stop the thugs threatening to kill her and her friends, find a painting, and figure out just what her mother-- who's on Interpol's most wanted list-- has to do with all of this. And Aimée thought she was busy before! By the time I'd read fifty pages of this book, I was hooked. Black has two high-octane plot lines, and I enjoyed them both. The first and most substantial story is Aimée trying to stay alive and find a priceless painting, and the second deals with René and his job in California-- a dream job that he soon learns isn't exactly what it appears to be. I wanted to know what was going on with both characters so badly that I couldn't read fast enough. 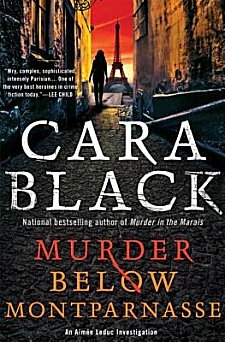 As usual, Black sets her story in a Parisian neighborhood, this time Montparnasse, and I loved learning about the Russians who've settled in that area over the course of many years. Reading Aimée Leduc mysteries always puts me in the mood for clothes shopping, ratatouille and a François Truffaut film; Murder Below Montparnasse is no exception. The only thing that didn't set well with me is that Aimée behaved more like an amateur than a seasoned private investigator. She does have the tendency to act like a bull in a china shop from time to time, but the possible involvement of her mother in this investigation seemed to throw her so off-kilter that she didn't seem to be herself. However, this series gets better and better with each book, and I can't wait to see what sort of trouble Aimée gets into next! I didn't expect this to be high-octane, Margot, so I was pleasantly surprised. I've got the first one in the series on my list of series to try. It's good to know that the 13th is still good, too.